Did you know almost one in every seven children is allergic to nickel? Not only that, most moms don’t know their kids have an allergy to nickel until after they’ve worn a pair of earrings that triggers a reaction. They’re left dealing with the uncomfortable, itchy red ears that make babies grouchy and children miserable. That’s why when choosing a pair of earrings, you need to look for hypoallergenic and nickel-free earrings. It isn’t as simple as showing kids the colorful options. Are these earrings safe for my child to wear? Will my child have an unexpected allergic reaction? How do I protect my child from low-quality pieces that can cause them discomfort? Whether it’s their first pair of earrings or a part of a growing collection, we’re here to help you find something that is beautiful, safe and that your child will love for a long time. Finding earrings that are safe and comfortable is a lot easier than you might think. There are two things you need to have for safe earrings, hypoallergenic and nickel-free. This ensures that your child’s ears will not react to the materials in the earring. Moreover, the two best materials for kid’s earrings are medical grade plastic and medical grade titanium. Hypoallergenic jewelry minimizes the risk of an allergic reaction. You may not know if your child has a metal allergy, but buying jewelry made from high-quality metal alloys or pure metals will lower the chances of your child experiencing an allergic reaction. Typically, hypoallergenic jewelry has extremely low levels of nickel, although we prefer pieces that are entirely nickel-free because this metal causes the most allergies on the skin. We know kids likely aren’t changing their earrings every day. They usually wear them day after day. Jewelry made of sturdy, lightweight medical-grade plastic is comfortable for all-day wear. Because medical-grade plastics are naturally nickel-free, they won’t react with even the most sensitive skin. You can rest easy because your child will be free from itchy earlobes and red rashes. To maximize comfort, make sure you’re choosing earrings with flat backs. They won’t snag on your little one’s clothing or hair. Earrings made of medical grade titanium are low maintenance. They are incredibly resistant to tarnishing and don’t require polishing. That’s what you need in a kid’s earring. Titanium is durable enough to last a lifetime. It’s allergy-free so you can feel good buying a pair of skin-friendly earrings that will grow with your child’s style. Let your little one shine with these titanium stud earrings or medical grade plastic earrings. They provide all-day comfort for kids with the most sensitive ears. Titanium Bezel Crystal Earrings - A gift you can feel good about. The medical-grade plastic, flower earrings are as durable as they are pretty. Your child will jump with pure excitement. Medical Plastic 6mm Flower Earrings - Made with hypoallergenic and tarnish-resistant golden titanium, these are fun and skin-friendly. Each of the five petals sparkles with genuine Swarovski crystals. You can choose from five colors. Medical Plastic 5mm Butterfly Earrings – Nothing looks cuter than tiny butterflies on your girl’s ears. Our 5mm butterflies are Swarovski crystals in Crystal, Aquamarine, Peridot, Light Rose, and Light Amethyst. 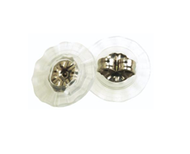 The medical grade plastic setting is easy to clean and allergy-free. Gold Titanium Star Earrings - Every kid knows a fancy occasion requires a special pair of earrings. Made with medical-grade titanium for your little one’s comfort and Swarovski crystals, these darling earrings will sparkle for years. She will be the hit of any party. Medical Plastic Dangle Heart Earrings – These stunning earrings look great on young kids or young adults. They are created with medical plastic. Each earring features two sets of stones. There is a 4mm stone at the post with a dangling, heart-shaped, 6mm stone. Both are shimmering Swarovski crystals. Protect your child’s ears from the effects of cheap jewelry and allergies. Blomdahl USA uses the finest quality materials manufactured under the strictest controls. Our sanitary and hygienic facility ensures that you and your child are the first to touch your earrings when they arrive. Medical grade plastic or titanium won’t cause allergies and will last for years. The design and sparkling crystals will have friends looking with envy as they admire your daughter’s new earrings. Explore our full collection of skin-friendly earrings at Blomdahl USA.